Well the first book I read for 2014 was another Liane Moriarty book called ‘What Alice Forgot’ and it was great. Book Summary Alice is twenty-nine. She is whimsical, optimistic and adores sleep, chocolate, her ramshackle new house and her wonderful husband Nick. What’s more, she’s looking forward to the birth of the ‘Sultana’ – her first baby. But now Alice has slipped and hit her head in her step-aerobics class and everyone’s telling her she’s misplaced the last ten years of her life. In fact, it would seem that Alice is actually thirty-nine and now she loves schedules, expensive lingerie, caffeine and manicures. She has three children and the honeymoon is well and truly over for her and Nick. In fact, he looks at her like she’s his worst enemy. What’s more, her beloved sister Elisabeth isn’t speaking to her either. And who is this ‘Gina’ everyone is so carefully trying not to mention? Alice isn’t sure that she likes life ten years on. Every photo is another memory she doesn’t have and nothing makes sense. Just how much can happen in a decade? Has she really lost her lovely husband forever? Well Liane Moriarty has done it again. After having picked ‘The Husbands Secret’, Liane Morarty’s latest book as my favourite one for 2013. I thought I might not enjoy another one of her books as much. How wrong was I. From the moment I picked up ‘What Alice Forgot’, I was hooked. When I started reading I realised “What Alice Forgot’ was written in a similar way to ‘The Husbands Secret’; alternating between the main characters. If you havent read this style of writing before you might find it a little confusing, but I think you will also discover that you are very eager to know what happens with each character and how they interact. I read it every chance I got and like ‘The Husbands Secret’ I thought about it when I wasn’t reading, as a result I would just stop what I was doing and find the time to read another chapter or two. ‘What Alice Forgot’ had a really interesting and believable story line and was easy to read with a good ending. For anyone who hasn’t read ‘What Alice Forgot’ and ‘The Husbands Secret’ do yourself a favour and pick them up. I am going to continue reading all of Liane’s books, and I can’t wait. 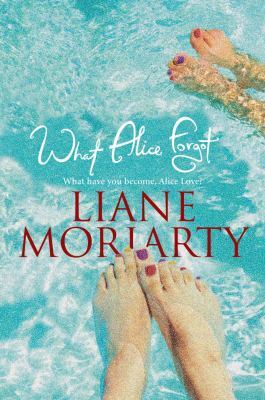 This entry was posted in All, Australian Authors, Recommended Reading and tagged Australian Author, book review, Liane Moriarty, Staff Pick, What Alice forgot by admin. Bookmark the permalink.